Championship side Ards have knocked out Premiership club Ballinamallard 7-6 on penalties after a 2-2 draw. After 12 successful spot-kicks, Shane McCabe's effort was saved by keeper Ryan Brown, and Ross Arthurs netted to put Ards into the semi-finals. Ballinamallard had taken an early lead through John Currie but a David McAllister header forced extra-time. Johnny Courtney restored United's lead in extra-time but Danny McKee levelled to take the game to spot-kicks. The semi-final draw takes place on Saturday and Ards will be joined in the hat by Coleraine, Warrenpoint Town and holders Cliftonville. An Ards victory had looked unlikely when Ballinamallard opened the scoring in the seventh minute. Jason McCartney's cross from the left fell for Currie whose volley found the net despite the efforts of Ards keeper Brown. McAllister headed Ards level in the 70th minute and the match went to the extra 30 minutes. 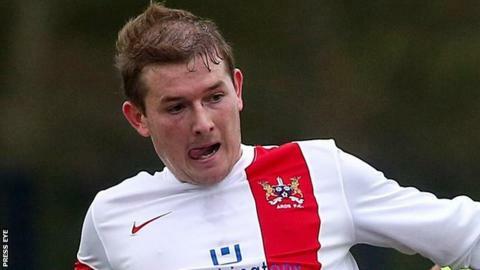 Ballinamallard, who beat Glentoran in a shoot-out in the quarter-finals last season, regained the lead when substitute Courtney rifled in from 12 yards. But another sub, McKee, converted after Craig McMillen's ball in from the left early in the second period of extra-time. Ballinamallard's six successful penalties were taken by Emmett Friars, Cathal Beacom, Richard Leckey, Liam Martin, Ryan Campbell and Jonny Lafferty. The Ards spot-kicks were converted by Thomas Lambe, Jordan Baker, McMillen, Rory Carson, McKee, Ben Brown and Arthurs.